JH: Today, I'd like to welcome a great guy to chat with us about, well, chatting. Or more specifically, tagging our chatting. 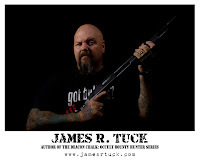 James R. Tuck will share his tips on writing dialogue tags. James was born and raised in Georgia and grew up enjoying all the South had to offer. Good food, adventure in mild winters and hot, muggy summers, excellent music, and good church folk. 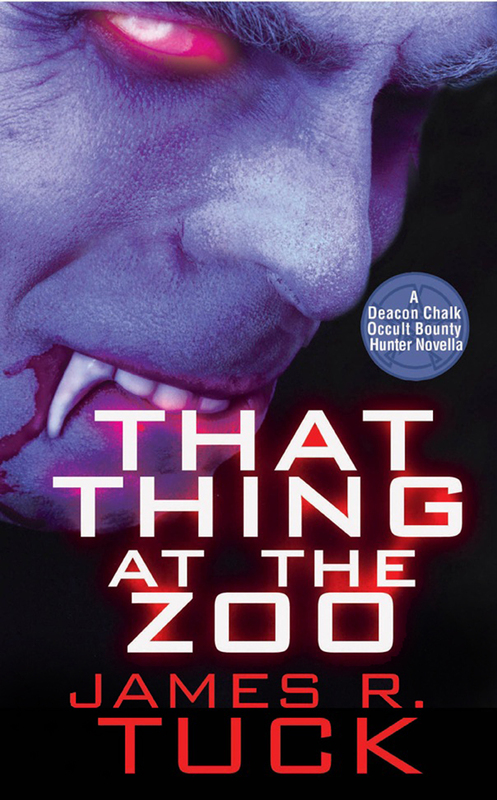 His debut novel Blood and Bullets releases today, and you can find more of his hero, Deacon Chalk, in his e-book novella That Thing at the Zoo. You can also find his short story, He Stopped Loving Her Today, at One Buck Horror. Gather around kids, today we are going to talk about the evils of speechtags. You know what speechtags are. They are the he said, she saids of the literary world. Those little tagalongs that hitch rides on lines of dialogue like hobos on freight trains. Some people like them because they are unobtrusive and easy on the eyes. They think you should use them exclusively, never deviating from the simple four letter word with a pronoun prefix. They feel the he/she said speechtag is simple, elegant, and unobtrusive. Speechtags are downright diabolical in their blandness. Worse, they are a virus in your manuscript. They breed like little parasites of laziness. They are the tribbles of your writing and you should cut them out like the infestation they are. Easy. You will show them who is talking. This is one of the subtle forms of show don't tell that takes a lot of work, but remember that every word you put on the page has to carry its own weight. Every word must pay for its time in your manuscript by doing as much work as you can squeeze out of it. Speechtags are the lazy way out. They are the corner cut. Whenever you are writing two people talking in your story, very rarely are they standing in one spot in an empty room speaking in monotone. Characters should be dynamic. Doing things. Feeling stuff. Being real. So take your cues from how things happen in real life. Someone who is bragging will stick out their chest and start speaking in a slightly deeper baritone. Someone who is lying may look away, glancing around furtively. They may drag their feet in circles of distraction. Someone who is trying to seduce another person will lean in, lowering their voice to create a sense of intimacy. Your characters need to follow suit. Have them do things to make it clear who is speaking and while they are at it, the things you have them doing should play into the conversation giving it subtext and weight that the words of dialogue don't create on their own. Let me show you what I mean. Here is what you should NOT do. “Speechtags are of the Devil.” he said. “I doubt speechtags have a religious affiliation.” she said. “They do. They are evil little gremlins who haunt stories.” he said. “I think you may be overstating things. They seem completely neutral to me.” she stated. “No they are not. They slip in like sins of omission seducing writers to the dark side of lazy writing. They demand nothing and steal moments of creativity. They are the step-stones to bland writing!” he cried. “You feel very strongly about this.” she said. See, that was bland, bland, bland! Now, this is how it should be done. “No they are not. They slip in like sins of omission seducing writers to the dark side of lazy writing. They demand nothing and steal moments of creativity. They are the step-stones to bland writing!” The vein on his forehead stood out in relief, running crookedly up from his left eyebrow to disappear into a shaggy hedge of hair. Seconds ticked by as he looked at her from under shadowed brows, his lips drawn tight into a line that made the dimple on his chin crooked. Without another word he spun and walked away, his exit punctuated by the bang of his heels on the floor. She let out a small chuckle and picked up her book. In example one you have no idea what is going on. You know that he said one thing and then she said something else. The words made sense, but you didn't know what was going on. In example two the cues as to who is speaking tell you volumes about the two people. One is obviously a writer, frustrated with his manuscript, the other is a spouse who loves him for all his mercurial writer wackiness. She finds him amusing and is unruffled by his outburst. She is also a reader. There is more in there that I am not outlining, but you can draw your own backstory out of that second example. Those are quick and dirty examples, but hopefully they show what I am talking about. Use the movement and the motion of your characters to impart the emotion of your characters. Using speechtags are like throwing loose bricks in the path for your dialogue to stumble over and twist its ankle. Instead replace them with physical cues that will give your reader insight into the characters who are talking. Doing this will punch up your writing and keep it interesting. 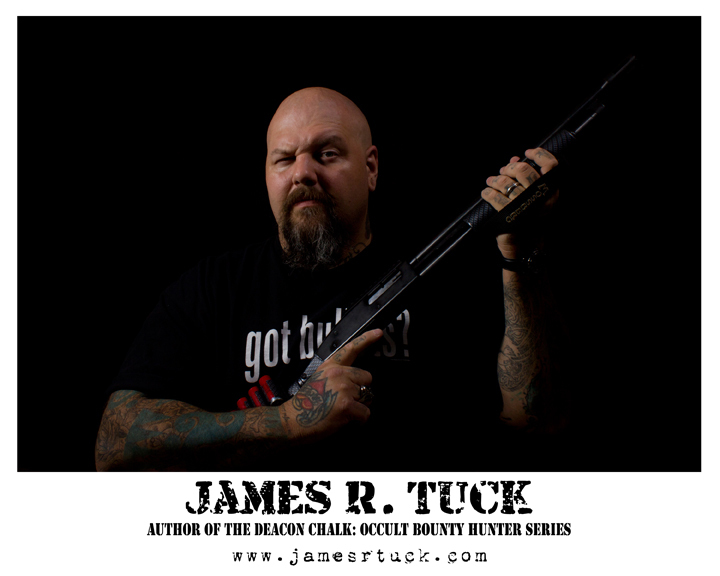 Ever since a monster murdered his family, Deacon Chalk hunts any creature that preys on the innocent. 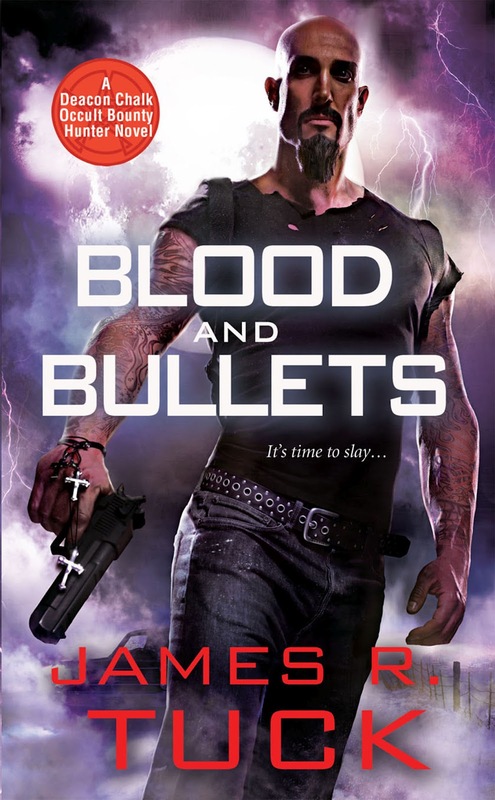 So when a pretty vampire girl "hires" him to eliminate a fellow slayer, Deacon goes to warn him—and barely escapes a vampire ambush. Now he's got a way-inexperienced newbie hunter to protect and everything from bloodsuckers to cursed immortals on his trail. There's also a malevolent force controlling the living and the undead, hellbent on turning Deacon's greatest loss into the one weapon that could destroy him. . .
Makes sense that the person who doesn't get it would be wearing a Snuggie. I like when the characters do their dialog. I like it ... A little less detail on what the character is doing would be nice (it made me stumble as much as the he said/she said), but I'm no expert :) cool! "Dialogue tags are evil!" she said. This is always an interesting topic. One of my favorite authors, Heather Brewer, seems to be in this camp, although she had used more regular dialogue tags over the years. I'm linking this to a writer's forum, although I'm anticipating a response. I love the contrasting examples. It's so hard to understand rules like these unless someone shows you how. I've always had trouble with action beats. It seems like my characters end up doing the same couple of things over and over and over again. I'll have to work on that. Thanks for the great post! I completely agree. I was at a writing seminar with Michael Stackpole and he said the same thing. I went home, wrote a scene, and it completely changed the tone of my writing. I do occasionally use he said/she said, but I usually prefer to set off who is talking with action or description. The only way I see this going wrong is if the writer gets overzealous and just dumps a bunch of wordy description on the page. Less is still more in this case. Great post and your book sounds right up my alley! Hee Hee Hee! Love it! Thanks so much, James and Janice. Thanks, good post. I've been trying to apply this in my revision - one other thing - where you break in with the tag. I've learned sometimes mid dialogue is effective. Very funny and very true. Thanks!!! Great example! Of course I had to go count the number of "said"s in my ms. There were 50 in 171 pages of an MG which doesn't seem horrible. So next step will be to see what happens if I try to eliminate a lot of them. Then on to "asked" ... By the end, I'll be so sick of the words I'll never use them again. Mission accomplished! GSMarlene, for MG, it's okay to have more tags than an adult book, as younger readers are still learning. Sometimes younger readers have trouble if things aren't as obvious. Always good to err on the side of caution there.